I attended the NYC PS3 launch party last night, although I sure felt like a scab crossing the line when I used my media credentials to get into the event 30 minutes before the extreme fanboys who had camped out on 56th St since Monday. Stepping inside the atrium of the Madison Ave SonyStyle store, I was greeted by a couple dozen PS3s, each hooked up to glorious 1080p Sony flatscreens. I even had a chance to play a few games before the soaked masses . My early impressions? I wasn't as blown away as I expected. Don't get me wrong, the graphics were great, and the gameplay was familiar and natural, but the games themselves didn't strike as that much better than those I've played on Xbox 360. Now that the console is finally out in the wild, it's only a matter of time before game developers figure out how to use all of the machine's ridiculous processing power and the PS3 assumes its rightful place at the top of the next gen console podium. Now, a few notes on the party itself. Thumbs Down: Motion sensors don't seem to do much. Give me rumble or give me death. Waiting in line for a day or two isn't bad when you figure that you can sell one machine for between $1700 and $4000 on eBay . . . I don't normally rake in $1000/day, so I'd say those in it for the profit definitely got their money's worth. I just dont see the since in speeding hundreds of dollars on a console. It was one thing when they were a couple of hudred dollars, I would wait a few months and then buy one. But $600-700 is just lunacy. For $700 on a PC, I could get 8GB of RAM, 2 different vid cards, a high end CPU, hard drives, water cooling setup, a low end computer that will do everything the PS3 can do and then some. I am purchasing a new high end vid card, a mid-high end CPU, 20" LCD monitor and a X-Fi sound card for just $300 more then the PS3 cost. It just doesnt make any sense to me. As for the above moron, Blogger. SPAM, no I take that back. Your comment was even worse then spam. I just cant seem to find the words that describe people like you. I would almost say I hate people like you, but I cant. It just reminds me once more why the US and the earth as a whole is falling apar at the seams. Morons like you. 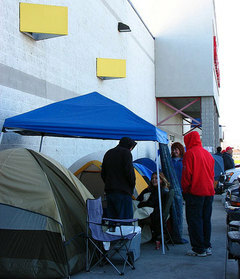 Nintendo sold 5 Wii's for every one PS3 this weekend.